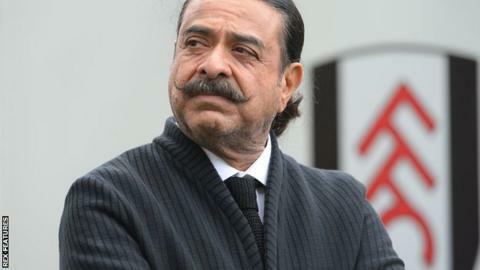 Fulham owner Shahid Khan has said the club must improve and has targeted a place in the play-offs this season. The 65-year-old, who also owns the Jacksonville Jaguars NFL team, bought Fulham from Mohamed Al Fayed in 2013. Fulham were relegated in 2014 and are 13th in the Championship, with fans calling for the sacking of manager Kit Symons at Wednesday's draw with Leeds. "I think we need to do better quite frankly," Khan told BBC Sport. "Our goal is to finish in the top six." Khan was at Craven Cottage for the 1-1 draw with Leeds, who have just replaced Uwe Rosler with former Boston, Crawley and Rotherham boss Steve Evans. Fulham have gone four matches without a win, and Khan said: "The resources are there, we're committed, but the results are what the results are. We need to re-gear up." Former Cottagers defender Symons, 44, was appointed permanent manager in October 2014 and the club finished 17th last season. Khan said: "He's a wonderful man, he's a Fulham man and I like him a lot. We want him to succeed."